I was booked to fly into Houston Saturday, September 13th so I could visit my grandmother who just had surgery for breast cancer. However, days before my scheduled trip, my grandmother, who lives (lived) a ferry ride out of Galveston on Crystal Beach was evacuated because of impending Ike. My flight was cancelled and I enjoyed a stay-cation in the gorgeous northeast weather. 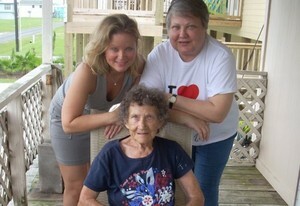 However, this picture of my mom, grandma and me on my grandma's porch is the last picture we'll take there. The porch no longer exists. Nor does her home. Nor my aunt's. 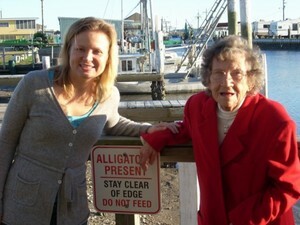 I'm assuming the alligators mentioned in this sign are roaming free. Because this cute dock and sign and restaurant it's attached to don't stand either. We took this picture in front of the Stingaree, a restaurant I always begged to visit when I ventured out to Crystal Beach. You can see video of it's destruction in this report from KHOU. It's near the end of the piece. Also, all the stores surrounding the area where my dad and I took this picture are gone. This was near the seawall in Galveston. The nearby Hooters was turned into a pile of rubble as well. Currently, my grandmother and her husband are staying with my parents in Texas. Like the bad news cliche, she told me she only has the clothes on her back. In a new city, they are looking for new doctors. She just had surgery and needs follow up care. He has medical needs as well. They are looking for housing, but I'm told nothing is available with the care they need. Their stories are similar to those of thousands of people right now. Being here and really only having seen the destruction online and on TV, it doesn't seem real to me yet. I wish I was there to cover their stories. At least I have these pictures. I wrote a little bit about my grandmother in a blog posting a few years back when I got stranded in Houston during a flood. My grandmother seems to be in good spirits. She wants me to visit her. I'm told she is wearing my old clothes from high school. A great reminder that a shirt on our back (and the love of loved ones) is the most important and enduring thing on Earth. Heather, glad to hear your family is safe and knowone was hurt. Like Tom said before me anything you need let me know. We love ya. This is your Aunt Bebe. I want to thank you for honoring my mother and your parents in your beautiful commentary. 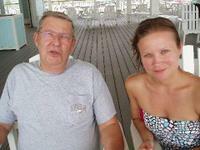 I burst into tears when I opened up your blog and saw the photo of your mother, my mother and you on mother's porch in Crystal Beach. I've been in constant contact with your mom and we are all doing our best to make them comfortable and get them help. The important thing is that they and your Aunt Yvette are safe. We will get through this. We are survivors and by golly, we are Texans! Thanks again for the beautiful thoughts. Sorry to hear of your Grandma and Aunt's unfortunate circumstances. Thank you for sharing your family story. Most of us FORGET past the shocking news clip - this helps remind us to keep doing our part...donations, blood drives...telling "their stories" and their plight. You motivated me to give blood this coming Thursday in Norwalk. My best to your entire family..prayers are with you all. Hi Heather. Sorry to hear about the impact of IKE on your family in Texas. Let us know if there is anything we can do to help. Sentimos mucho haber sabido tragedia tu tia y abuela.